When referring to the period before he became enlightened, the Buddha is known as Siddhārtha Gautama (Sanskrit) or Siddhattha Gotama (Pali). Siddhartha, his given name, means "one who achieves his goals". Gautama is his family name. Gautama Buddha is believed by Buddhists to be an enlightened teacher who attained full Buddhahood and shared his insights to help sentient beings end rebirth and suffering. Accounts of his life, discourses and monastic rules are believed by Buddhists to have been summarised after his death and memorized by his followers. Various collections of teachings attributed to him were passed down by oral tradition and first committed to writing about 400 years later. Most scholars accept that he lived, taught and founded a monastic order during the Mahajanapada era in India during the reign of Bimbisara, the ruler of the Magadha empire, and died during the early years of the reign of Ajatshatru who was the successor of Bimbisara, thus making him a younger contemporary of Mahavira, the Jain teacher. Apart from the Vedic Brahmins, the Buddha's lifetime coincided with the flourishing of other influential sramana schools of thoughts like Ājīvika, Cārvāka, Jain, and Ajñana. It was also the age of influential thinkers like Mahāvīra, Pūraṇa Kassapa , Makkhali Gosāla, Ajita Kesakambalī, Pakudha Kaccāyana, and Sañjaya Belaṭṭhaputta, whose viewpoints the Buddha most certainly must have been acquainted with and influenced by. [note 4] Indeed, Sariputta and Maudgalyāyana, two of the foremost disciples of the Buddha, were formerly the foremost disciples of Sañjaya Belaṭṭhaputta, the skeptic. 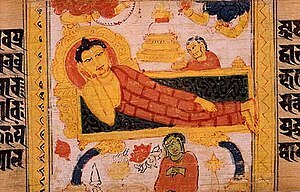 There is also evidence to suggest that the two masters, Alara Kalama and Udaka Ramaputta, were indeed historical figures and they most probably taught Buddha two different forms of meditative techniques. The evidence of the early texts suggests that Siddhārtha Gautama was born into the Shakya clan, a community that was on the periphery, both geographically and culturally, of the northeastern Indian subcontinent in the 5th century BCE. According to Gombrich, they seem to have had no cast system, but did have servants. Gombrich states, "Some historians call [Shakya] an oligarchy, some a republic; certainly it was not a brahminical monarchy, and makes more than dubious the later story that the future Buddha’s father was the local king." In this view, Siddhartha's father was more likely an important figure in the republic or oligarchy, rather than a traditional monarch. Historians believe that the Shakyas were self governing and heads of housholds met in council to discuss problems and reach unanimous decisions. According to Gombrich, this gave the Buddha a model of a castless society; in the Sangha he instituted rank based on seniority counted from ordination. The Buddhist tradition regards Lumbini, present-day Nepal, to be the birthplace of the Buddha. [note 1] According to tradition, he grew up in Kapilavastu. [note 1] The exact site of ancient Kapilavastu is unknown. It may have been either Piprahwa, Uttar Pradesh, present-day India, or Tilaurakot, present-day Nepal. Both places belonged to the Sakya territory, and are located only 15 miles apart from each other. Siddharta Gautama was born as a Kshatriya,[note 8] the son of Śuddhodana, "an elected chief of the Shakya clan", whose capital was Kapilavastu, and who were later annexed by the growing Kingdom of Kosala during the Buddha's lifetime. Gautama was the family name. His mother, Queen Maha Maya (Māyādevī) was a Koliyan princess. The Buddha spent about 45 years of his life teaching the dharma. He is said to have traveled in the Gangetic Plain, in what is now Uttar Pradesh, Bihar and southern Nepal, teaching a diverse range of people: from nobles to servants, murderers such as Angulimala, and cannibals such as Alavaka. Although the Buddha's language remains unknown, it's likely that he taught in one or more of a variety of closely related Middle Indo-Aryan dialects, of which Pali may be a standardization. The sangha, the Buddha's disciples, would travel throughout the subcontinent, expounding the dharma. On the night Siddhartha was conceived, his mother Queen Maya dreamt that a white elephant with six white tusks entered her right side. As was the Shakya tradition, when Queen Maya knew the time of the birth was near, she left Kapilvastu for her father's kingdom to give birth. However, her son was born on the way, at Lumbini, in a garden beneath a sal tree. Siddharth was born ten months after his conception. Siddartha's mother, Queen Maya died soon after giving birth. Siddhartha would be raised by his father, King Śuddhodana of the Shakya clan, and his mother's younger sister, Maha Pajapati. Siddhartha's father, King Śuddhodana, gave him the name Siddhartha, meaning "one who achieves his goals". Soon after his birth, the sages of the kingdom visited the King and prophesied that Siddhartha would either become a great king and military conqueror or he would renounce the material world and become a great spiritual teacher. Thus, as a young man, Siddhartha wore robes of the finest silk, ate the best food and was surrounded by beautiful dancing girls. He was extremely handsome and he excelled at his studies and at every type of sporting contest. His father arranged for him to marry a young woman of exceptional grace and beauty, Yasodhara. Siddhartha and Yasodhara lived together in peace and harmony for many years, and Yasodhara bore him a son named Rahula. Siddartha practicing ascetism with his five companions. According to some accounts,[note 10] after his awakening, the Buddha debated with himself whether or not he should teach the Dharma to others. He was concerned that humans were so overpowered by ignorance, greed and hatred that they would not understand his dharma, which is subtle, deep and hard to grasp. However, while he was contemplating this, he was approached by Brahmā Sahampati, who urged the Buddha to teach, arguing that at least some people will understand the dharma. The Buddha relented, and agreed to teach. The Buddha gave his first teaching to his five companions in Deer Park near Varanasi (Benares) in northern India. Traditionally, it is said the Buddha "set in motion what the Wheel of Dharma" by delivering his first sermon to the five companions with whom he had sought enlightenment. Together with him, they formed the first saṅgha: the company of Buddhist monks. All five of his companions became arahants, and within the first two months, with the conversion of Yasa and fifty four of his friends, the number of such arahants is said to have grown to 60. The conversion of three brothers named Kassapa followed, with their reputed 200, 300 and 500 disciples, respectively. This swelled the sangha to more than 1,000. Now two years after his awakening, the Buddha agreed to return, and made a two-month journey by foot to Kapilavastu, teaching the dharma as he went. When he reached his father's home in Kapilavastu, he taught the dharma to his father and his extended family. During the visit, many members of the royal family joined the sangha. The Buddha's cousins Ananda and Anuruddha became two of his five chief disciples. At the age of seven, his son Rahula also joined, and became one of his ten chief disciples. His half-brother Nanda also joined and became an arahant. At the age of 80, the Buddha announced that he would soon reach Parinirvana, or the final deathless state, and abandon his earthly body. The Buddha then asked all the attendant Bhikkhus to clarify any doubts or questions they had. They had none. The Buddha then entered Parinirvana. The Buddha's final words are reported to have been: "All composite things (Saṅkhāra) are perishable. Strive for your own liberation with diligence" (Pali: 'vayadhammā saṅkhārā appamādena sampādethā'). His body was cremated and the relics were placed in monuments or stupas, some of which are believed to have survived until the present. For example, The Temple of the Tooth or "Dalada Maligawa" in Sri Lanka is the place where what some believe to be the relic of the right tooth of Buddha is kept at present. Of these, the Buddhacarita is considered to be the earliest full biography. This text is an epic poem written by the poet Aśvaghoṣa, and dating around the beginning of the 2nd century CE. The Lalitavistara Sūtra is thought to be the next oldest biography, a Mahāyāna/Sarvāstivāda biography dating to the 3rd century CE. The Mahāvastu from the Mahāsāṃghika Lokottaravāda tradition is another major biography, composed incrementally until perhaps the 4th century CE. The Dharmaguptaka biography of the Buddha is the most exhaustive, and is entitled the Abhiniṣkramaṇa Sūtra, and various Chinese translations of this date between the 3rd and 6th century CE. Lastly, the Nidānakathā is from the Theravāda tradition in Sri Lanka and was composed in the 5th century CE by Buddhaghoṣa. Additional sources from the Pali Canon include the Jātakas, the Mahapadana Sutta (DN 14), and the Achariyabhuta Sutta (MN 123) which include selective accounts that may be older, but are not full biographies. The Jātakas retell previous lives of Gautama as a bodhisattva, and the first collection of these can be dated among the earliest Buddhist texts. The Mahāpadāna Sutta and Achariyabhuta Sutta both recount miraculous events surrounding Gautama's birth, such as the bodhisattva's descent from Tuṣita Heaven into his mother's womb. After his death, Buddha's cremation relics were divided amongst 8 royal families and his disciples; centuries later they would be enshrined by King Ashoka into 84,000 stupas. [web 10] Many supernatural legends surround the history of alleged relics as they accompanied the spread of Buddhism and gave legitimacy to rulers. ↑ 1.0 1.1 1.2 1.3 1.4 According to the Buddhist tradition, following the Nidanakatha,[web 6] the introductory to the Jataka tales, the stories of the former lives of the Buddha, Gautama was born in Lumbini, present-day Nepal. [web 7][web 8] In the mid-3rd century BCE the Emperor Ashoka determined that Lumbini was Gautama's birthplace and thus installed a pillar there with the inscription: "...this is where the Buddha, sage of the Śākyas (Śākyamuni), was born." Walsh: "He belonged to the Sakya clan dwelling on the edge of the Himalayas, his actual birthplace being a few miles north of the present-day Northern Indian border, in Nepal. His father was in fact an elected chief of the clan rather than the king he was later made out to be, though his title was raja – a term which only partly corresponds to our word 'king'. 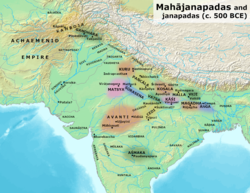 Some of the states of North India at that time were kingdoms and others republics, and the Sakyan republic was subject to the powerful king of neighbouring Kosala, which lay to the south". The exact location of ancient Kapilavastu is unknown. It may have been either Piprahwa in Uttar Pradesh, northern India, or Tilaurakot, present-day Nepal. The two cities are located only fifteen miles from each other. Geoffrey Samuels notes that several locations of both early Buddhism and Jainism are closely related to Yaksha-worship, that several Yakshas were "converted" to Buddhism, a well-known example being Vajrapani,[note 5] and that several Yaksha-shrines, where trees were worshipped, were converted into Buddhist holy places. ↑ Hypothetical root budh "perceive" 1. Pali buddha – "understood, enlightened", masculine "the Buddha"; Aśokan (the language of the Inscriptions of Aśoka) Budhe nominative singular; Prakrit buddha – ‘ known, awakened ’; Waigalī būdāī, "truth"; Bashkarīk budh "he heard"; Tōrwālī būdo preterite of bū, "to see, know" from bṓdhati; Phalūṛa búddo preterite of buǰǰ , "to understand" from búdhyatē; Shina Gilgitī dialect budo, "awake"; Gurēsī dialect budyōnṷ intransitive "to wake"; Kashmiri bọ̆du, "quick of understanding (especially of a child)"; Sindhī ḇudho, past participle (passive) of ḇujhaṇu, "to understand" from búdhyatē, West Pahāṛī buddhā, preterite of bujṇā, "to know"; Sinhalese buj (j written for d), budu, bud, but, "the Buddha". Turner, Sir Ralph Lilley. "buddha 9276; 1962–1985". A comparative dictionary of the Indo-Aryan languages. Digital Dictionaries of South Asia, University of Chicago. London: Oxford University Press. p. 525. Retrieved 22 February 2010. ↑ 3.0 3.1 3.2 Warder 2000, p. 45. ↑ 8.0 8.1 8.2 Gombrich 2002, p. 49. ↑ 31.0 31.1 31.2 31.3 Keown & Prebish 2013, p. 436. ↑ 34.0 34.1 Nakamura 1980, p. 18. ↑ 35.0 35.1 Huntington 1986. ↑ 36.0 36.1 Gombrich 1988, p. 49. ↑ 38.0 38.1 Huntington 1988. ↑ 39.0 39.1 39.2 39.3 Samuel 2010. ↑ 42.0 42.1 42.2 Dhammika 1993. ↑ 43.0 43.1 Corless 1989, p. 4. ↑ 49.0 49.1 Fowler 2005, p. 32. ↑ 53.0 53.1 Karetzky 2000, p. xxi. ——— (1992), "Dating the Buddha: a red herring revealed", in Bechert, Heinz, Die Datierung des historischen Buddha, Symposien zur Buddhismusforschung (in Deutsch), IV (2), Gottingen: Vandenhoeck and Ruprecht, pp. 237–59 . Narain, A.K. (1993). "Book Review: Heinz Bechert (ed. ), The dating of the Historical Buddha, part I". Journal of The International Association of Buddhist Studies. 16 (1): 187–201. Ruegg, Seyford (1999). "A new publication on the date and historiography of Buddha´s decease (nirvana): a review article". Bulletin of the Schoool of Oriental and Afrikan Studies, University of London. 62 (1): 82–87. ↑ "Maha-parinibbana Sutta", Digha Nikaya (16), Access insight, verse 56 . ↑ 3.0 3.1 Vergano, Dan (25 November 2013). "Oldest Buddhist Shrine Uncovered In Nepal May Push Back the Buddha's Birth Date". National Geographic. Retrieved 26 November 2013. ↑ Gombrich, Richard (2013), Recent discovery of "earliest Buddhist shrine" a sham?, Tricycle . ↑ Tan, Piya (2009-12-21), Ambaṭṭha Sutta. Theme: Religious arrogance versus spiritual openness (PDF), Dharma farer . ↑ Davids, Rhys, ed. (1878), Buddhist birth-stories; Jataka tales. The commentary introd. entitled Nidanakatha; the story of the lineage. Translated from V. Fausböll's ed. of the Pali text by TW Rhys Davids (new & rev. ed.) . This article includes content from Gautama Buddha on Wikipedia (view authors). License under CC BY-SA 3.0.